Odyssey Contemporary Art and Performance: CyPosium!! On 12 Octo­ber 2012, a cyber­for­mance sym­po­sium will be hosted by UpStage, the Water­wheel Tap and inde­pen­dent cyber­form­ers, where cyber­form­ers will dis­cuss their online per­for­mances with other artists, researchers and inter­ested par­tic­i­pants. Ques­tions we would like to tackle in CyPo­sium include: What dif­fer­ent kind of events hap­pened? What did they make pos­si­ble? What was spe­cial about the event? Why were things done in a cer­tain way and what were the results? 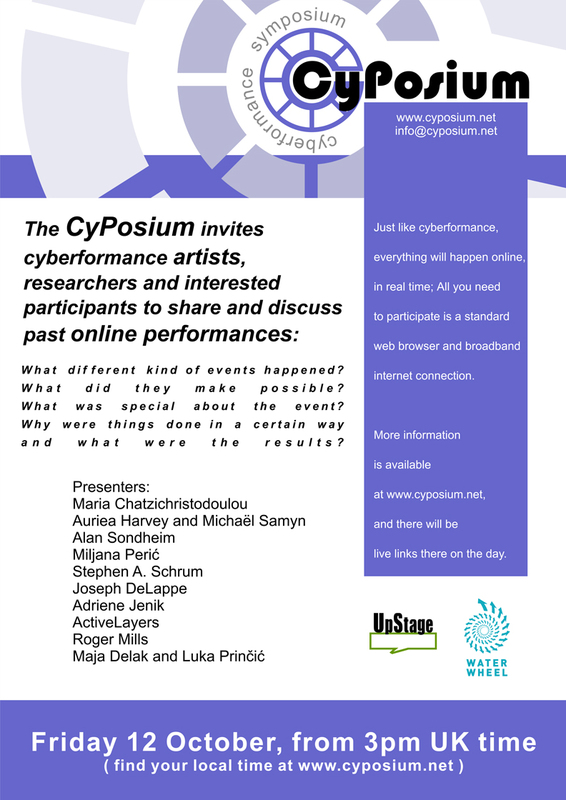 The CyPosium invites cyberperformance artists, researchers and interested participants to share and discuss past online performances. the leading real estate developers of the country. estate developers of the country. today one of the leading real estate developers of the country. thank for your post .